Kampala — Discussions on unresolved issues delaying the South Sudan peace agreement will resume on Monday in the Sudanese capital, Khartoum, following a five-day break to mark Idd-al-Adha festivities. Sudanese foreign affairs minister Al-Dierdiry al-Dhikheri, who also doubles as chief negotiator, had earlier said the discussions would be concluded by Sunday but the Intergovernmental Authority on Development (Igad) said the talks had to be deferred. 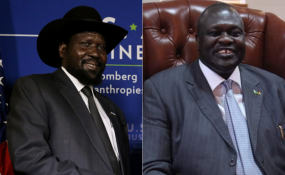 The warring parties--President Salva Kiir's Sudan People's Liberation Movement and Army in Government (SPLM/A-IG), Dr Riek Machar's Sudan People's Liberation Movement and Army in Opposition (SPLM/A-IO) and a coalition of other political parties--in a statement issued by Igad, said they remained committed to "full implementation of the revitalised agreement that we expect to conclude and renew our quest for a united, peaceful and prosperous society based on justice, equality, respect for human rights and the rule of law." "While we will continue to engage on the remaining issues, and in particular on how to translate these framework agreements into programmes and plans of action for lasting peace and development, today, we affirm our joint commitment to full implementation of this agreement, the Khartoum Declaration and Agreements on the Outstanding Security and Governance Issues," the Igad statement reads, in part. Igad, a seven-member regional bloc comprising Uganda, Kenya, Ethiopia, Somalia, Djibouti, Sudan, and South Sudan, has been overseeing the peace process since fighting first broke out in Africa's youngest nation in December 2013. The parties also admitted they have "not been true to the aspirations of agreement on Cessation of Hostilities, Protection of Civilians and Humanitarian Access". But they pledged to "fully adhere to the ceasefire in order to allow displaced populations to begin rebuilding their livelihoods" and process implementation of the revitalised peace agreement to begin. Some of the remaining sticky issues include humanitarian assistance and reconstruction, resource, economic and financial management arrangements, transitional justice, reconciliation and healing, parameters of permanent constitution, joint monitoring and evaluation commission, and supremacy of this agreement and procedures for amendment of the agreement. Support. The international community has since voiced support for the peace process and pledged to continue assistance in rebuilding of the world's youngest nation. Japanese foreign press secretary Takeshi Osuga in a statement said Tokyo "strongly hopes the parties will continue cooperating constructively to ensure inclusivity and sustainability of the agreements..."
The Russian foreign affairs ministry, similarly, in a statement specifically commended Sudan president Omar Bashir's "tangible contribution" and said the constant diplomatic efforts by the African community to defuse the South Sudan crisis reinforced the African Union's proclaimed principle of "African solutions to African problems."